With the storm that was Arthur giving me the day off from work, I decided that it was time to venture out for burger #12. 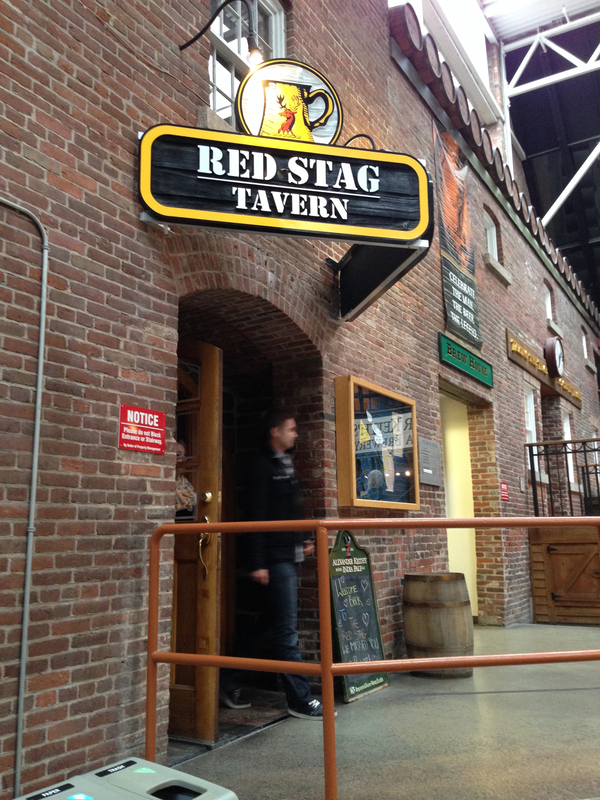 I chose the Red Stag Tavern, located at 1496 Lower Water Street, which was a place I had never set foot in before. Nestled inside The Historic Alexander Keith’s Brewery, this large tavern offers many food options to satisfy any type of customer. For this burger, I chose their Chipotle Burger. The appearance of this burger was very bittersweet to me. I really liked how it was presented very cleanly but still gave off a tavern/pub vibe. The sprinkling of the greenery around the plate was also a nice touch. The thing that kind of put me off was the lack of any substance on the burger. 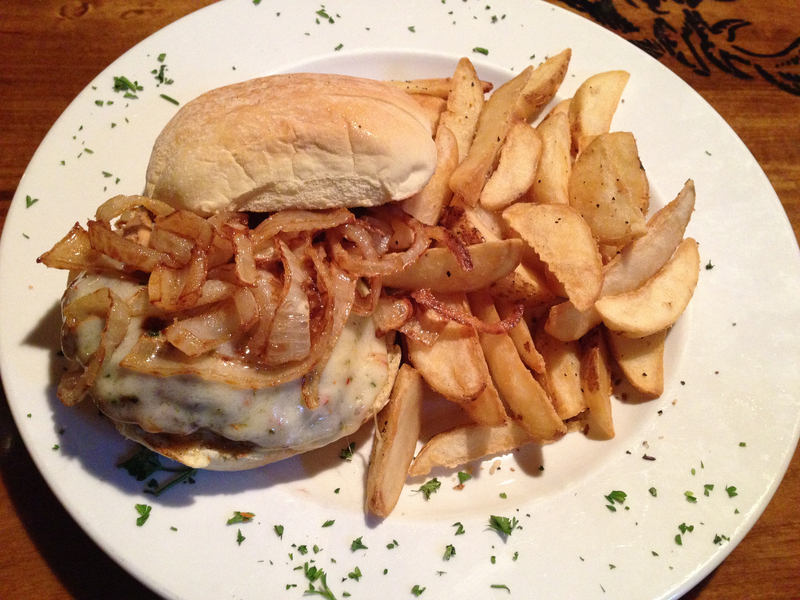 The frizzled onions and melted havarti did look really delicious, but I was just worried that this burger was not really going to have much to it. After taking a few bites, I was very impressed with the actual burger patty itself. It was bursting with flavor, and it was really nice to see a restaurant take the time to perfect their patty, as it is truly the most important part of the burger. 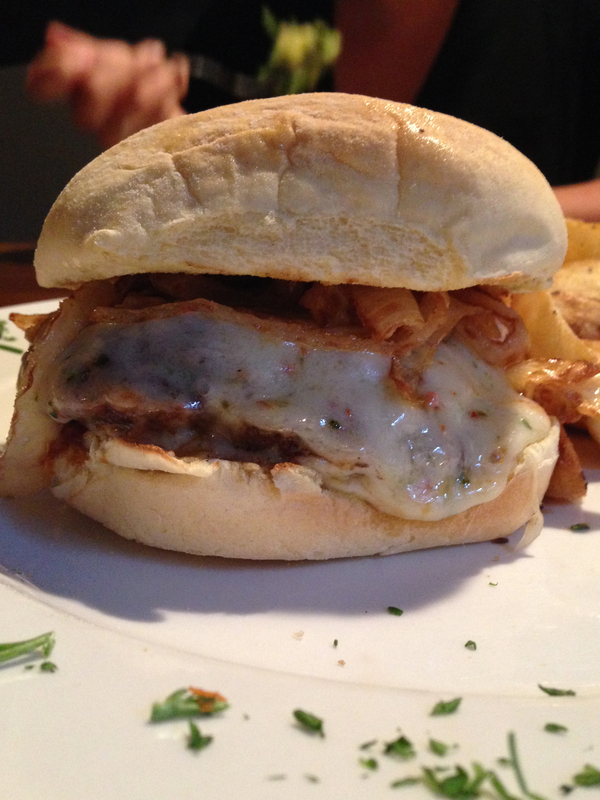 I liked the kick that the jalapeno havarti gave the burger, and it was great in contrast with the delicious patty. However, this burger was lacking in the toppings department. Don’t get me wrong, more isn’t always better when it comes to burgers. I just think this one really could benefit from some more veggies to pair with the hearty meat portion. That being said, this burger did taste pretty good, but I think that it could go from good to great with just a little more creativity. Having never been in the Red Stag, or the Keith’s brewery for that matter (does that make me a bad Haligonian? ), I had no clue what to expect. I really liked the layout inside, and the brick and stonework made the interior really charming. The service wasn’t anything super spectacular, not that it was bad or anything, the waitresses just did the usual “how are things tasting” every once in a while, and didn’t really make an effort to engage in conversation (which isn’t always a bad thing). To get this burger, you have to shell out $13.99. In my opinion, I think this is too much for a burger that isn’t comprised of all that much. The awesome patty does make it a slightly more acceptable price, but it is still a little steep. If they were to add some more veggies to the burger, I think that this price would be completely acceptable. I’m somewhat conflicted with this burger. I wasn’t overly impressed with the lack of toppings, but the perfect patty was a pretty great time. I think that maybe I will have to go back sometime and get one of their different burgers, that maybe has a bit more to it than this one did.